For a number of years organisations have been inviting ‘specialist consultants’ to inspire their businesses. From aromatherapists to management consultants, comedians to drumming workshops, everyone has had an experience of something different. 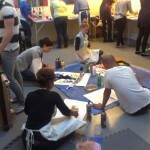 An Art Therapy Workshop is suitable for a Fun Day, or to De-stress, or to focus on some organisational dynamics. At a deeper level the experience helps work colleagues respect, understand and connect more; this can result in better work relationships leading to increased creativity, productivity and profit. I have been running bespoke workshops for several years and enjoy devising specific programmes for varying organisations. 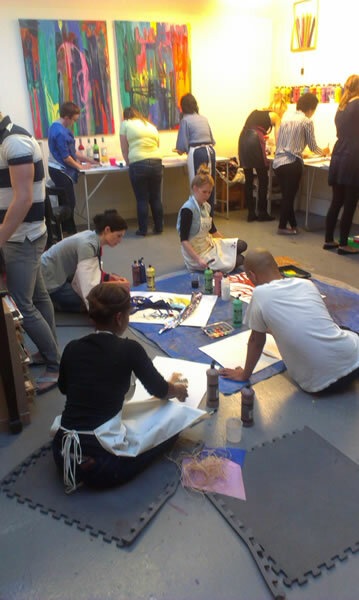 They include ‘Art for Stress-release and Self-regulation’; ‘Art Stimulates Creativity’; ‘Group Art Process’ for Team Building. Evaluation and feedback forms after the various workshops show the consistent need for quiet time, reflective space, peer respect and acknowledgement, connection with others as well as the value for one’s own creative process. There is a difference between ongoing clinical art therapy work and a one-off workshop which needs to accommodate specific objectives and work in the ‘here and now’. 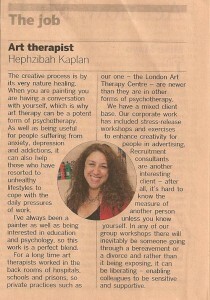 As Director of London Art Therapy Centre Ltd. I have an interest in business issues and HR as well as having run groups for many years. 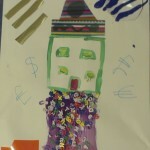 What first attracted me to ‘Art for the Heart’ was my curiosity to find out how Art therapy could be relevant for market research as the two, in my mind, didn’t seem to immediately connect! The scene - think of art class at school when you were 10 years old and you will have a good picture of the room we were in: scattered with paint, brushes, all sorts of art materials, a relaxed atmosphere. 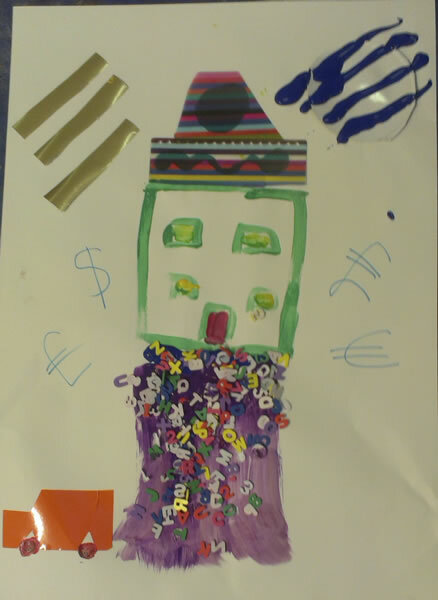 Hephzibah, our Art Therapist, was very clear on two points: first, art therapists don’t interpret art; second – most importantly to me – you don’t need to be able to paint or draw. 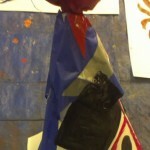 Rather, it is the process of making art: the conversation with your piece. The inner conversation with yourself is intrinsic in the process. Our first task was to ‘draw ourselves as a tree’. It would be fair to say I was pretty stumped. After staring at a blank piece of paper for several minutes I threw away the paintbrush and got my hands involved. I ended up with a swirly whirlpool (the heart of the tree/me) of blue with wild strokes of yellow, green and orange (the branches/aspects of me). Once our 20 minute time limit was up, we sat around a circle with our art in the middle and went, one-by-one, around the room talking about how we created these and what we thought they meant to us. Others chimed in with strangely insightful comments about our characters, just by observing what we had created. 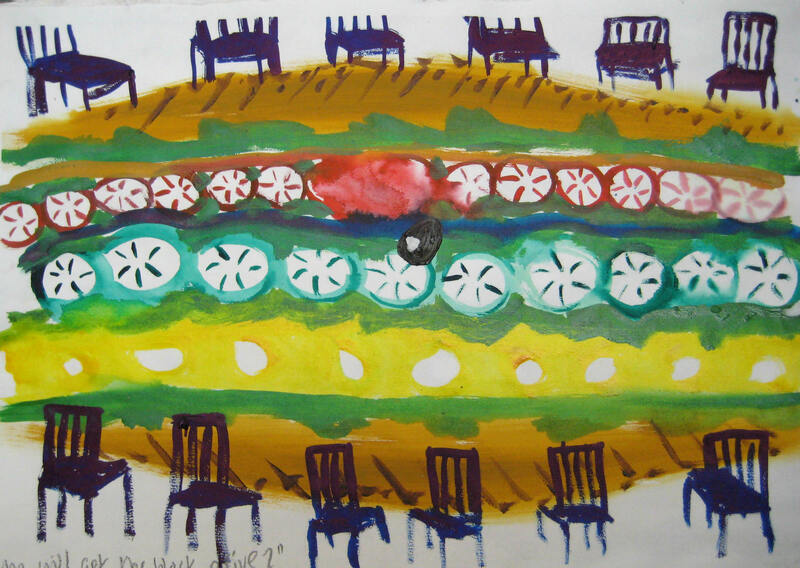 How can Art Therapy be practically applied to what we do? 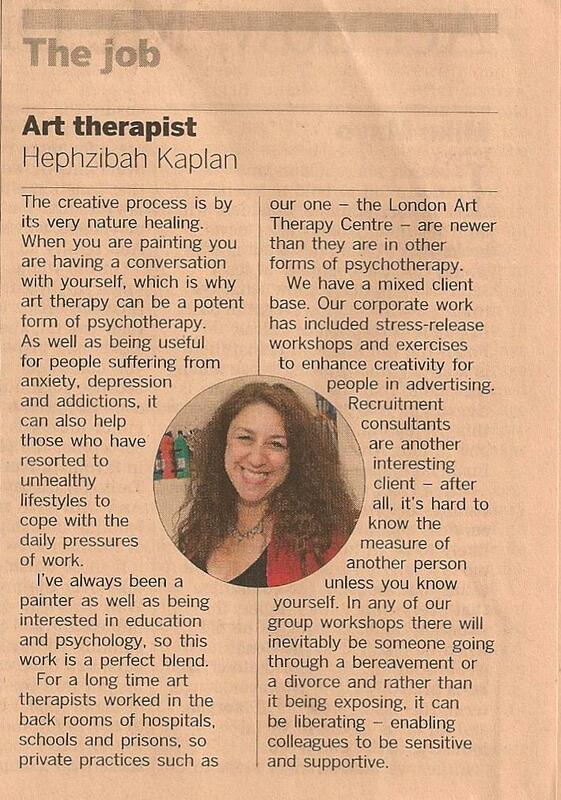 I would say: very easily applied, with co-moderation involving an Art Therapist such as Hephzibah. It is a development of the projection techniques we already employ. 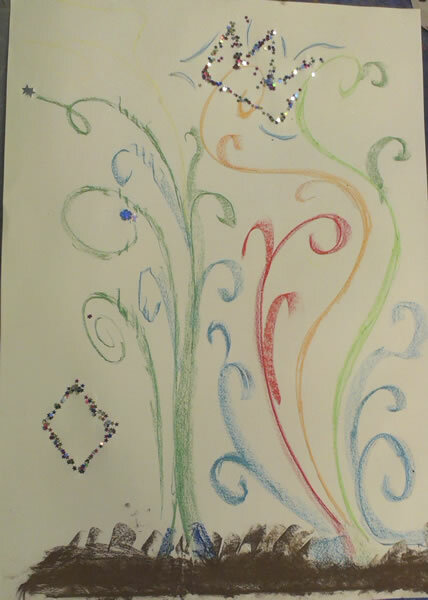 Art therapy can be used to: generate questions; understand individual expression; used simply as an ‘icebreaker’. Sessions are thematically structured – the first session being the cathartic ‘vomit’, the need to get dirty. This is followed by the second theme which allows for deeper insights and gets closer to the issue with a respondent more comfortable and fluent with the creative process. 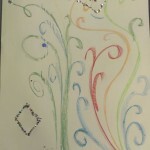 The power of Art Therapy is, essentially, derived from its creativity. We all (by varying degrees) have an instinct and a need to be nourished. We all (again by varying degrees) seek to be playful and can best express this creativity in a relaxed, non-judgemental environment. Leaving Hephzibah’s studio, clutching my ‘me as a tree impression’, I felt a mixture of gratitude, curiosity and excitement. I’m keen to investigate ways to integrate this technique into future qualitative studies. As Hephzibah insisted throughout, it is the process that we need to understand and observe, not the end product. Are you courageous enough to find out more?